Relax Sacks provides you with the ability to make your retreat room unique, fun, and relaxing. Whether your furnishing the game room for kids, the home theater room for dad, or the family's great room, Relax Sacks has comfortable, innovative, and stylish furniture to make every room different and more entertaining. 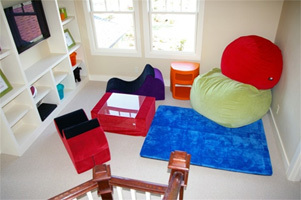 Select from our line of giant foam-filled bean bags to our fun and exciting game chairs. Relax Sacks has a variety of accessories that you'll love and that will make your relaxation experience even better.